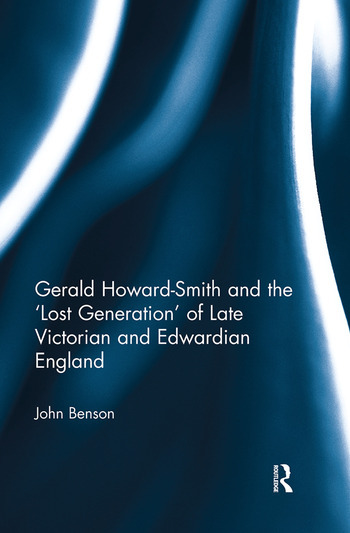 As well as telling the fascinating story of Gerald Howard-Smith for the first time, this important new biography explores such complex and important issues as childhood and adolescence, class relations, sporting achievement, manliness and masculinity, metropolitan-provincial relationships, and forms of commemoration. It will therefore be of interest to educationalists, sports historians, local and regional historians, and those interested in class, gender and civilian-military relations – indeed all those seeking to understand the economic, social, and cultural life of late nineteenth and early twentieth-century Britain. John Benson is Emeritus Professor of History at the University of Wolverhampton. He has written widely on nineteenth and twentieth-century history, has held visiting positions in Canada and Japan, and has spoken on his work throughout Great Britain as well as in Australia, Canada, Germany, Japan, the Netherlands, New Zealand and the United States of America. His books include British Coalminers in the Nineteenth Century, The Working Class in Britain, 1850-1939, The Rise of Consumer Society in Britain, 1880-1980, Prime Time: A History of the Middle Aged in Twentieth-Century Britain, Affluence and Authority: A Social History of Twentieth-Century Britain, and The Wolverhampton Tragedy: Death and the ‘Respectable’ Mr Lawrence.